On his first day in office, President Obama ordered the government to ignore any legal opinion produced by the Bush Justice Department having to do with interrogations. It turns out that in its waning days the Bush administration itself repudiated many of the counterterrorism-related opinions its lawyers issued shortly after September 2001. Yesterday's release of seven memos generated in 2001 and 2002 by the Bush Office of Legal Counsel -- the DOJ office that essentially determines binding law for the executive branch -- cleared up some mysteries about the legal thinking behind counterterrorism policies including harsh interrogation, extraordinary rendition and warrantless surveillance. For the most part the memos' existence, if not their contents, had previously been known. (We know that some 35 other memos remain secret.) But the memos of repudiation released at the same time were remarkable for their fresh revelation and also for their forcefulness. 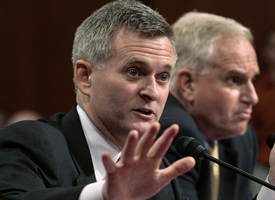 The reasoning in 10 opinions that said the president had unchecked power to detain, interrogate and prosecute terrorism suspects, ignore the Foreign Intelligence Surveillance Act, suspend international treaties and flout the Fourth Amendment in domestic military activities "should not be treated as authoritative for any purpose," wrote Steven Bradbury, Bush's acting OLC chief in his second term, in internal memos on Oct. 6, 2008 (PDF) and Jan. 15, 2009 (PDF). Bradbury called the analyses "not sustainable," "doubtful," "not supported by convincing reasoning," "highly questionable," "not satisfactory," "unpersuasive," and/or simply "incorrect." OLC lawyers are considered to be among the nation's best educated and smartest. Two authors of the denounced memos are John Yoo, a professor at U.C. Berkeley's law school, and Jay Bybee, now a judge on the U.S. Court of Appeals for the Ninth Circuit. Both had been criticized in the past for generating legal advice that stretched the limits of interrogation. A third lawyer whose work Bradbury repudiated was Patrick Philbin, who is now a partner at the law firm Kirkland & Ellis LLP. His tenure with the Bush administration was perhaps most dramatically marked by his nighttime accompaniment of then-Deputy Attorney General James Comey to Attorney General John Ashcroft's hospital bed in 2004. They succeeded in heading off a White House attempt to obtain Ashcroft's reauthorization of a legally suspect domestic spying program. That the president has unilateral power, untouchable by Congress, to detain, interrogate, and prosecute enemy combatants. This claim appears in at least five counterterrorism memos: One dated March 13, 2002 (PDF), from then-OLC chief Jay Bybee to Defense Department General Counsel William Haynes II; one dated April 8, 2002, from OLC deputy Patrick Philbin to the DOJ's Office of Legislative Affairs; one dated June 27, 2002, from OLC deputy John Yoo to the DOJ Office of Legislative Affairs; one – the much discussed Aug. 1, 2002 “torture memo” – reported to have been authored by Yoo but signed by boss Bybee and addressed to then-White House counsel Alberto Gonzales; and one dated March 14, 2003, also authored by Yoo, to the DOD's Haynes. The OLC publicly withdrew the last two opinions in December 2004. Bradbury’s Jan. 15 memo said that "the sweeping assertions" of presidential power in these opinions "categorically precludes Congress from enacting any legislation concerning the detention, interrogation, prosecution, and transfer of enemy combatants." Such an analysis, he said, was "unsustainable" and "incorrect." He expressed "substantial doubts" about the view in two of the opinions that precedent showed congressional authority to regulate the capture only of enemy property, not people. His memo cites seven historical sources to the contrary. That the Foreign Intelligence Surveillance Act does not apply to the president. Bradbury's Jan. 15 memo said that a "number of classified OLC opinions" from 2001 and 2002 -- which have yet to be released -- argue that Congress failed to state that FISA, which requires warrants and other rules for surveillance, applies to the president. This claim is "not supported by convincing reasoning," said Bradbury. The classified opinions, presumably making the case for warrantless surveillance, have been withdrawn or superseded, he wrote. That the president has "unconstrained discretion to suspend treaty obligations of the United States at any time and for any reason." This proposition appears in two opinions: one dated Nov. 15, 2001 (PDF), from Yoo and OLC Special Counsel Robert Delahunty to the National Security Council's legal adviser, and another, dated Jan. 22, 2002, from Bybee to DOD's Haynes and then-White House counsel Gonzales. Bradbury said the later Bush OLC found the authors' discussion of relevant history to be "unpersuasive," their analysis to be "doubtful," and their consideration of contrary constitutional principles to be "insufficient." That the government may conduct warrantless searches in its "self-defense." A Sept. 25, 2001 memo from Yoo to David Kris -- then-associate deputy attorney general and now under consideration as Obama's nominee to head the DOJ’s national security division -- makes this unusual argument. Yoo wrote that the rule forgiving government's use of deadly force when circumstances show it is necessary to self-defense or to protect others should be extended to permit warrantless surveillance for national security purposes. Bradbury said that "this reasoning inappropriately conflates" two unrelated areas of the law. That the Fourth and First Amendments do not apply in domestic military operations. An Oct. 23, 2001 memo from Yoo to DOD's Haynes and then-White House counsel Gonzales claims that the Constitution's prohibition against unreasonable searches and seizures and its protection of free speech and press rights would be nonexistent or diminished during military operations on U.S. soil to "deter and prevent terrorist attacks." In his Oct. 6, 2008 internal memorandum, Bradbury rejected these propositions for being "incorrect or highly questionable." 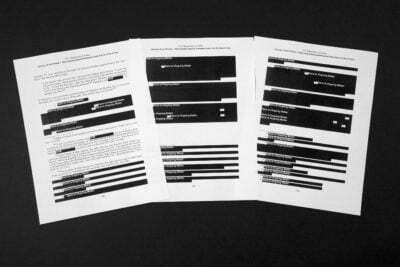 He said the memo's analysis was "not satisfactory," "unnecessary," "overbroad," and "far too general and divorced from specific facts and circumstances." These sound like critiques that would make any lawyer cringe. But Bradbury wrote in a footnote to his Jan. 15 memo that neither repudiating document "is intended to suggest in any way that the attorneys involved in the preparation of the opinions in question did not satisfy all applicable standards of professional responsibility." As Newsweek recently reported, a long-standing internal Justice Department investigation into the professional conduct of Yoo, Bybee and Bradbury himself is progressing. Should Attorney General Eric Holder approve the report, any adverse findings could be referred to state bar associations for possible disciplinary action. Bradbury noted the "extraordinary historical context" of the disavowed OLC opinions' creation. They were "issued in the wake of the atrocities of 9/11" and took on "novel and complex legal questions in a time of great danger and under extraordinary time pressure."